SHOWN WITH 207 C-7 INCANDESCENT ASSORTED COLORED LAMPS. COMPLETE WITH STANDARD GROUND MOUNT HARDWARE. 6' ANIMATED GINGERBREAD GIRL HAS 243 C-7 INCANDESCENT LAMPS @1,215 WATTS & 98 LBS. 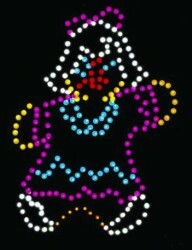 ALSO AVAILABLE: 8 1/2' GINGERBREAD GIRL: STATIC HAS 276 C-7 INCANDESCENT LAMPS @1,380 WATTS & 120 LBS. ANIMATED HAS 324 C-7 INCANDESCENT LAMPS @ 1,620 WATTS & 140 LBS.